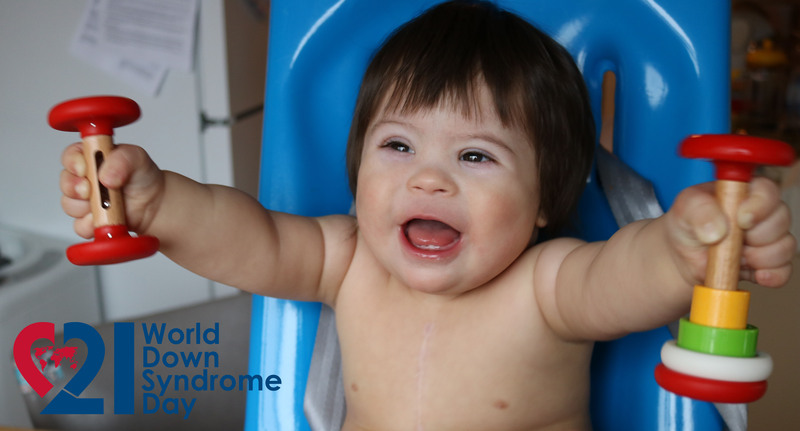 March 21 marks World Down Syndrome Day, a day of awareness and celebration of people with Down Syndrome (DS) and their vital role in our communities. The date (3/21) represents the three copies of the 21st chromosome, a unique characteristic of people with Down Syndrome, otherwise known as Trisomy 21. Our son Flash has that extra chromosome, in addition to the most charming smile. In spite of a challenging first year that included open heart surgery, we feel truly lucky to be his parents. His determination is inspiring and he surprises us daily with his potential. Through this journey, we’ve been amazed by the support we’ve received. It hasn’t just come from our family and friends – since the day of his birth, our son has received superb medical care and early intervention. Flash is thriving and developing beautifully at his own unique pace. We feel confident that our son will grow to be a self-assured and tenacious adult. What does worry us, however, is if he will have the supports in place to fully contribute to his community. Having worked in disability services for some time, I am unfortunately familiar with the phrase “services cliff”. This is the concept that as a person with disabilities becomes an adult, they age out of the services available to them and they face an increasing number of barriers in their communities. A disability isn’t merely defined by an extra chromosome or a physical impairment; it also depends on an individual’s environment. Removing barriers to participation will facilitate success, allowing people to develop their abilities rather than feel hindered by their disabilities. Our family is committed to creating a community that not only welcomes Flash, but that will promote his agency and self-efficacy, enabling him to achieve his goals. Early intervention is critical, but so is continued support into adulthood. For this reason, my role as a Board Member for the VDRC is one of the most important things I can do for my son. The VDRC is working toward the future I want for Flash: one in which people with disabilities feel empowered, in charge, and making informed decisions about their lives. I love coming into the office and seeing such a diverse group of people creating a supportive space for one another. People with Down Syndrome, like all people with disabilities, are incredibly valuable members of our communities. It is my privilege to be on the board of an organization that not only recognizes this reality, but also works tirelessly to promote it. Does this page need updates or fixes? What needs to be improved on this page? Read More about Stand Up to Bullying! Read More about Nanaimo: Let’s Talk CP!